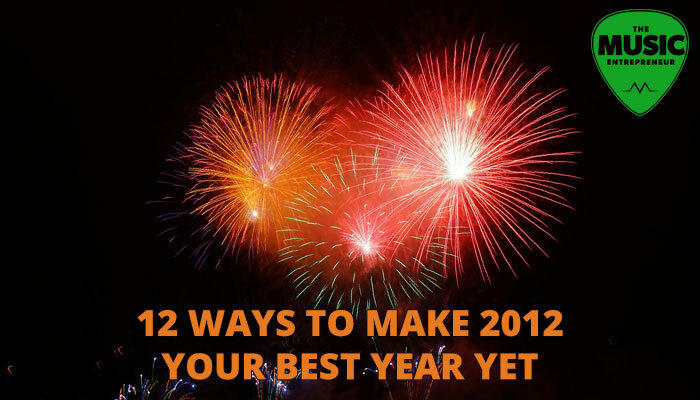 Here is a list of things to do this year to make it your best year ever. You can change your life in 2012. You have to take care of yourself before you can ever expect to take care of anyone else – mentally, physically, spiritually, emotionally. Make sure you are eating a healthy diet, exercising, meditating, sleeping, resting, and scheduling some recreation time in your life. Take care of yourself so you can give your best to others. Purchase some great books and audios that you are going to delve into this year. Subscribe to some blogs and podcasts. Continue to learn, grow, and develop your own potential. There is no other way – you have to plunge into some great material. Perfection is a stifling force, but practice is a key ingredient to ongoing personal improvement. Commit to practicing your instrument, vocals, songwriting, producing or composing skills. Set aside some time for this activity, and put it in your schedule. Strive for excellence in your chosen field. Remain a student of life and decide to learn from others who are doing what you want to do, or have gone before you and attained success in their field. If Tiger Woods needs a coach or a mentor, how much more do you and I? Find someone you can be accountable to. Finish any projects that are hanging in the air. Resist the temptation to start anything new (but do make sure to write down any sparks of inspiration that you have) until you’re done with existing projects. Do you want new things in your experience? Then strive to clear away the clutter in your life. Instead of loafing on the couch, watching TV, or playing video games, take some time to think about what you want in life. Buy a travel magazine. Post pictures up around your house and in your dream book (make a dream book if you don’t have one). Test-drive your dream car(s). Ask a realtor to take you to some million-dollar-homes. Get around the scene and see what people are up to. Learn about new developments. Make new connections, and develop new friendships and partnerships. If you write blog posts, set up a schedule to roll them out on a consistent basis. If you produce podcast episodes, likewise get on a regular schedule. Put out more updates. If you’re a recording artist, consider recording more singles and EPs, or put together demo packages as free downloads. Try something new and different. Talk to a stranger. Make some phone calls to old friends. Go to a meetup group you’ve never been to before. Go skydiving (you don’t have to go skydiving specifically, but you know what I’m getting at). Spend time away from home, and explore the world. It will get you out of your normal routine. Your routine is great if it’s producing results you want, but will have to be altered if it’s not. There’s no better way to get out of your rut than to travel. Even in small things like making a good meal or seeing your house or living space clean and organized, start to see desired results in your mind’s eye. Practically every successful person does this. Imagine everything in detail. Imagine sights, smells, sounds, colors, sentences or phrases that would be said when you reach that destination, and so on. Note: don’t go into any business without first knowing what you’re getting into. I still believe that network marketing is great for teaching you the ins and outs of business, but you can end up spending a lot of money in getting that (expensive) education. Still better than going to college or university for the same education (in my opinion), because they don’t really teach you what you need to know about business, but contrary to what they might tell you, I don’t believe network marketing is for everybody. So take my points here with a grain of salt. It is fine to talk about your financial needs, but it’s better to do something about them. I am pretty enthusiastic about affiliate marketing and network marketing, and so is financial expert Robert Kiyosaki. In these tough economic times, I think it would be best to consider options you haven’t before. There are great financial and health benefits, but more than that, there are great personal growth benefits too. One, final, bonus tip: streamline your finances. Cut off the cable TV, turn the thermostat down a bit, unsubscribe from entertainment services, magazines, newspapers, etc. Take away the distractions so you can focus on what you really want.